A Place for My Stuff: Why Do I Still Have This? It's been a while since I found something of the "Why the hell do I still have this?" category. But I found it. 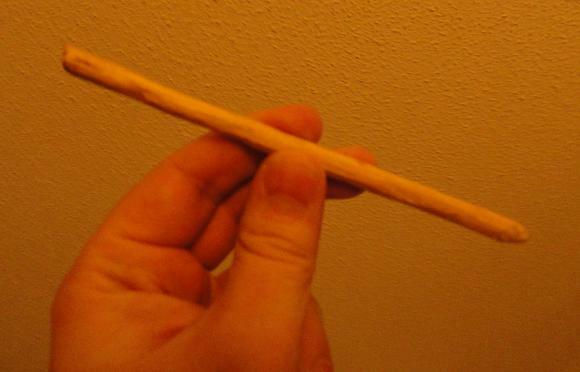 It's a stick whittled to somewhat resemble a pencil. And it looks like I've had it for a long time. The story behind this? Damned if I know. I think maybe I whittled it in Boy Scout camp when I was 13. Maybe I used it to spool cassette tapes? Maybe I was planning on painting it like a pencil and using it as a prank item, watching with sadistic glee as people tried to write with it, only to hear holes in the paper? Did somebody else maybe whittle it for me? Or did I keep this for nothing more than the fact it was something I spent time on? I have no idea. But if the item has absolutely no use to me, and doesn't even serve as a memento for anything, then I'd say it's safe to get rid of it. OK, one final look at the bureau-top junk that got removed. Before I continue though, I'd like to say that I hope this isn't just seen as a "listing" experience. When I blog about things I've gotten rid of, I do get some idea of why I might have kept something in the first place, where some of the common problem areas are, and how I can hopefully eliminate some of that in the future. Stuff to shred. Not all of this junk was to be carelessly thrown in the trash. Some stuff was better suited for the shredder. Like a piece of paper that had by bank account info on it. Yeah, that gets shredded and burned. Also, these papers that came with my prescriptions. Do you get these too? Especially if the stuff you're picking up comes in a tube? You go to a pharmacy to pick something up, and they give you a few huge stapled pieces of paper with information you don't need, and in my case, my last name spelled wrong across the top in big printed letters. Then on top of that, there's a set of instructions in the box itself. Who needs this? I certainly don't. A clear plastic bag that went to...maybe that guitar stand I bought a few months ago? Maybe something else? Well, enough guessing. Hate note from my wife. I don't need guilt-trips in verbal form, let alone in written form. Tag from wife's yellow gold chain. "14k", and a big price tag of which I only had to pay a fraction (Thank you, JC Penny!). I probably should have photographed these last two items together, for comedic value. 2011 Concert Venue Schedule. Yes, it has the band we saw listed in there. But I really don't need this as a souvenir. Free brownies coupon. We could not find this brand in ANY of the stores. And the coupon expired last November. I tried. Ozzy article. My father cuts things like this out of the paper and snail-mails them to me on occasion. I appreciate the thought, and I do read the article. But 6 months later, I think I can say in most cases that it's safe to throw these away. 2 Hotel Key Cards. Most hotels these days have long since ditched metal keys in favor of programmable, cheap plastic card keys. Some of these we end up keeping as souvenirs. But chances are that if it was a really good trip, you already have a ton of other souvenirs anyway that are better. Time to ditch these. And finally, some clothing tags. You know, you buy a shirt or a pair of pants, and see these things attached to them. Some of them are even facy, like they're made of cork or something. But if you've already been wearing something to the point that you know you're not going to return it, then these are junk. Some more crazy things I found in my enormous pile on my bureau. I think cataloging this stuff has taken longer than getting rid of it! Oh well, that's why I have a blog. Broken triangle. If you look in the stationary aisle of any drug store, you'll usually find a set of drawing triangles. Namely, you'll see a 30-60-90 triangle and a 45-45-90 triangle, sometimes packed with a straight ruler and a compass. This is one of the 30-60-90 ones, and it has some history. It came in a plastic case with some similar drawing tools, which I got sometime when I was in 6th or 7th grade. I started using the case as a general pencil case. I'm sure at some point I threw out the case, but the original contents are probably lingering around. I managed to hang on to this fragile triangle without breaking it. At least, until recently. I saw that one of the coners was broken off, and I'm pretty sure that happened in recent years. In these past 25+ years, have I EVER used it? Not that I can remember. Does ANYBODY ever use these things? Well I went to college for math, and I sure didn't use it for any of those classes. My wife and I however had a friend whose 11 year-old son wanted to serious get into drawing, and one of the comic-drawing drawing books we gave him mentioned all of the tools you should have: kneaded eraser, T-square, and so on, including the triangles. So I was carring this triangle in my pocket and was waiting to give it to him. Well, to make a long story sort, we're not associating with the mother any mre. If the kid needs a triangle, he doesn't need a broken one. Into the trash you go, triangle. A local music store who has since moved to a new location. No need for this card. Business card for a Vietnamese restaurant. My wife and I lifed this place, but they're out of the way, and the only reason we went in the first place is because we got a Restaurant.com coupon for them, and they're no longer taking them. Time to throw this out. Appointment cards. You know how they give these to you when you go to the dentist, the doctor, a massage therapist, etc? Do you still hang on to these after the appointment is long over? There's no need to. If this is a place you go back to, you'll have their number elsewhere, or have future visits already written in your calendar. Or even if you don't, they'll typically call you to give you a reminder. I AM however glad I took a quick glance at these before I tossed them. A while back I had an optometrist tell me I had "lattice degeneration", as she wrote on the card. Good to know the name of it! Printed emails from a friend regarding a project we wanted to do. Well, we still haven't done it. I really don't know at this point if I'll ever get him to collaborate on something! Besides, I have the emails still saved on-line. So I can ditch this. Likewise, a couple of math problems I was working on. I may visit these in the future, so I put them in my "math" folder on my computer, and got rid of the paper. Printed, edited list from Wikipedia. And I can go back there to look it up again. No need for the paper, even if it was a help back at that time I printed it. Job description for a position I was going for in my last company, but couldn't get. I sure don't need a reminder for it. Old Job vs. New Job comparison. I changed jobs recently. It was a really difficult choice to make, and I was weighing my options. So naturally I made a list to get my thoughts written down. But what's done is done. Time to ditch this. One of the new target areas on my most recent "to-do" list was my bureau. Namely, the top of my bureau. Lots of stuff collects there. Come to think of it, that was the same situation with my father when I was growing up. The bureau top became quite the stuff magnet. I started to tackle this once and for all. It's still a work in progress as I type this, mainly because it's been a careful process of sorting through it. I'm most certainly going to end up throwing away most of it, but given that some of these things include papers with bank account numbers, receipts, etc., it's worth dividing the trash into "to be shredded" and "not to be shredded" piles. The most popular type of item was, indeed, receipts. Usually I'm very good with keeping receipts and keeping them separate. Normally I keep them in my wallet, then eventually transfer them to an envelope when my wallet gets too full. They then get transferred to their respective bank or credit card statements before being filed away with them. 2 receipts for CVS. For those of you who don't live in a region where there's a CVS and never heard of them before, CVS is actually one of the largest drug store chains in the US, second only to Walgreen's. Growing up, my mother told me that it stood for "Convenient Variety Store", though it turns out that it's actually "Consumer Value Stores". Of course, they never use that name, and I doubt half of the CVS employees know what it stands for. I guess I saved these for the "Extra Value Dollars" they usually print on the end of the receipts. That's their cute euphemism for "coupons". Usually when you end up buying a certain product, your coupon will be for some rival product of the same type. I used to go there a lot, but since moving in 2010 I haven't been around a CVS, so I go elsewhere. So there's really no use for coupons or receipts like these. Several receipts from Daddy's Junky Music. I'll have more to say about them in a future blog post. Concert ticket receipts. And yes, of course they're for concerts that I already went to. The funny thing about Ticket Master is that they not only give you a printed receipt in the envelope on a sheet of paper, but an extra printed ticket that just has your name and address on it. My wife saw this in the pile I was throwing away and gasped "Don't throw out my ticket stubs!" I showed it to her and explained that it was just a receipt. Ski rental receipt. Now that was actually quite handy to have at the time. They put me in ski boots that were ridiculously tight, even by ski boot standards. So I went back to the lodge, showed them the receipt, and they set me up with new boots. That was a great trip. It was also about a year ago. And I have photos from the event, so I don't even need this as a souvenir. A sticker type of receipt that says "Nonrefundable if lost or stolen" with a bunch of numbers on it. What did this go to? I have no idea. I'm guessing maybe the lift ticket I got with the skiing trip. Hotel receipt. You know how they print out a full 8.5x11" sheet for this and slip it under your door before you leave? Well, you can't fit that in a wallet. But the bureau is no place for it either. Into the shredder you go. A printed receipt from Edible Arrangements. The person I gave the gift to got them. That was back in 2010. I could have started growing a new tree with the seeds by now. Optometrist visit receipt. All this really reminded me was that the bastards don't take my new eye insurance plan, when I thought they did. Some years ago I bought a "fire box". This is a secure box that not only locks, but will allegedly survive a fire. So if your house burns down, the stuff inside the box will still be intact. Recently I was looking for some item and thought that it might be in the fire box. I found the key and opened it and didn't see it in there. More importantly, I realized I was keeping next to NOTHING inside of my fire box. In fact, it was stuff that I wouldn't even remember if a fire consumed my home. Old list of phone numbers. This was a handy little card of hand-written numbers that I pseudo-laminated and used to keep in my wallet. That was back in the mid to late 90s. Most of the people on here are people I know longer talk to, already have their number stored on my cell phone and other places, or have since changed their number. Medical plan card to an old medical plan that I'm no longer on, and haven't been on in over 5 years. Into the shredder you go. Spencer Gifts rewards/membership card. They no longer support these. But damn, I sure got a lot of use out of it back in the day. At some point it felt like they were sending me $10 coupons every month. Discovery store rewards/membership card. They too no longer support these. Karaoke slip. You know, when you go to a bar to do karaoke? And you write your name along with the catalog number of the song you want to do? Not only is that particular night long since over, but I don't even have a clue what bar this was from or what song it was. The moral of the story? Fire boxes seem like a good investment...if you stuff you put inside is actually of some value to you! "Ewww!" gagged my wife as she cleaned near the end table. It was the pumpkin we bought back in October. It was very green then, so that meant it would be lasting longer than it normally would have. But this one was...no longer solid. It was practically melted on the table. How could we have overlooked something like this? Right in the living room? I don't know. As much of a pack rat as I may be, one thing I've always prided myself in is not hoarding any sort of vegetable substances or perishable items. I may have had cardboard from food boxes sitting in the corner of my kitchen, but certainly not with rotting food inside. So this was quite a shock. But again, how DID we miss such a thing? Well first of all, it didn't smell. I'm sure we would have noticed something sooner if it did. Second of all, it was on the end table next to the couch, but in a corner of the living room that's easy to look over. I think we might have even had a piece of paper or somthing over it. So there it sat, overlook and forgotten until it was time to clean. And clean it, I did.